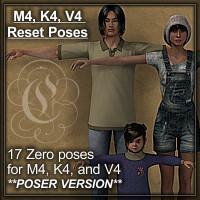 This is just a collection of 17 utility zero poses for Michael 4, the Kids 4, and Victoria 4. All files are in Poser .pz2 format. Included files are listed on the main promo render.